In a book that moves between philosophy and history, and with lasting significance for both, Arnold Davidson elaborates a powerful new method for considering the history of concepts and the nature of scientific knowledge, a method he calls "historical epistemology." He applies this method to the history of sexuality, with important consequences for our understanding of desire, abnormality, and sexuality itself. In Davidson's view, it was the emergence of a science of sexuality that made it possible, even inevitable, for us to become preoccupied with our true sexuality. 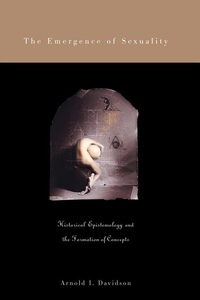 Historical epistemology attempts to reveal how this new form of experience that we call "sexuality" is linked to the emergence of new structures of knowledge, and especially to a new style of reasoning and the concepts employed within it. Thus Davidson shows how, starting in the second half of the nineteenth century, a new psychiatric style of reasoning about diseases emerges that makes possible, among other things, statements about sexual perversion that quickly become commonplace in discussions of sexuality. Considering a wide range of examples, from Thomas Aquinas to Freud, Davidson develops the methodological lessons of Georges Canguilhem and Michel Foucault in order to analyze the history of our experience of normativity and its deviations.